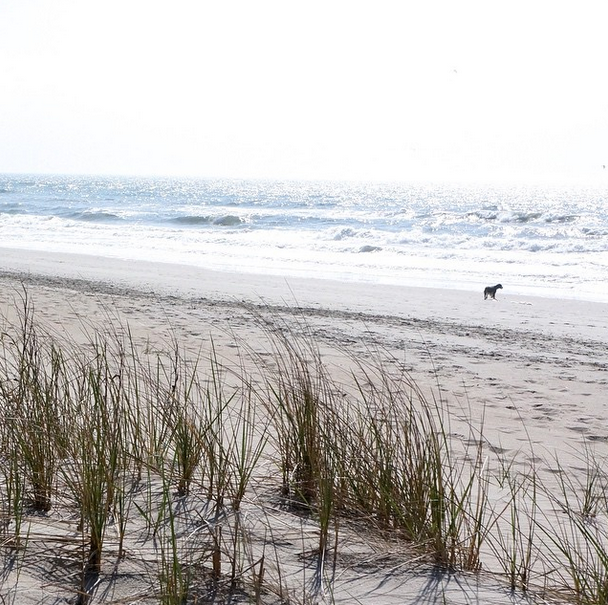 In late March, my family took a whirlwind press trip to North Carolina's Crystal Coast. I happen to love this area of North Carolina, and know it fairly well because my father-in-law lives in Beaufort, which is NC's third oldest town. Despite knowing the area, this was a trip of firsts for us, and I really got to experience the area as a tourist rather than visiting as a "daughter-in-law." 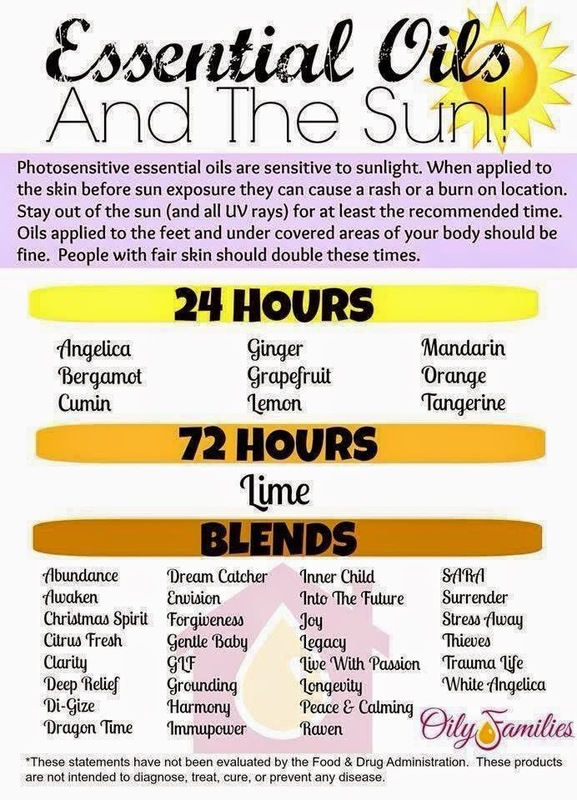 I have lots to share about the Crystal Coast, but I'm going to start with some basics. Where: North Carolina's Crystal Coast is considered part of North Carolina's Southern Outer Banks. The area consists of Emerald Isle, Indian Beach, Salter Path, Pine Knoll Shores, Atlantic Beach, Morehead City, Historic Beaufort, (pronounced Bo-fort), Harker's Island, and Cape Lookout. 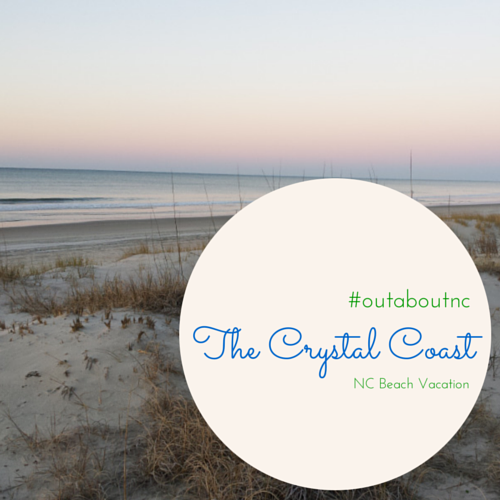 How to Get There: The Crystal Coast area is about a 3-hour drive from my hometown of Raleigh, N.C. The Coastal Carolina Regional Airport is located in New Bern, N.C. and it's about 45 minutes away from this coastal area. This airport has about ten incoming flights a day originating from Raleigh, Charlotte, Atlanta, and Greensboro. This is an area where you will need a car. Where to Check-In: The Crystal Coast is filled with vacation rentals, Bed and Breakfast Inns, and several chain hotels from the limited-service market (think Hampton Inn) to full-service (think Doubletree) with a restaurant on-site. There are accommodations for every budget. 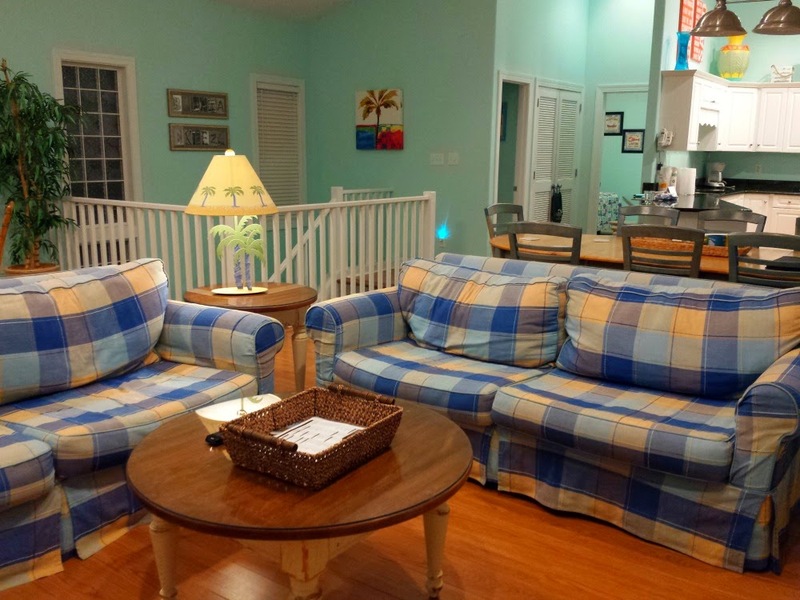 We stayed with Emerald Isle Realty in Emerald Isle, N.C, which has an impressive portfolio of 700 rentals from condos, duplexes, and huge homes. They apparently know my taste well, and decided that our base for this long weekend should be Bahama Breeze West. This is a Sandcastle rental, which gives you some hotel-like amenities. With the Sandcastle rental service, linens and towels are furnished. The beds are already made when you arrive which is so nice, especially if you arrive late like we did ( 9 p.m.). This duplex has five beautiful, spacious bedrooms, four bathrooms, two living areas, and a full-kitchen. It would fit two families very comfortably. Summer rates are (sitdown, please) $4,225 weekly, but when you think in terms of luxury hotel costs and the space you get in this home, it's much more cost-effective for this type of luxury vacation. 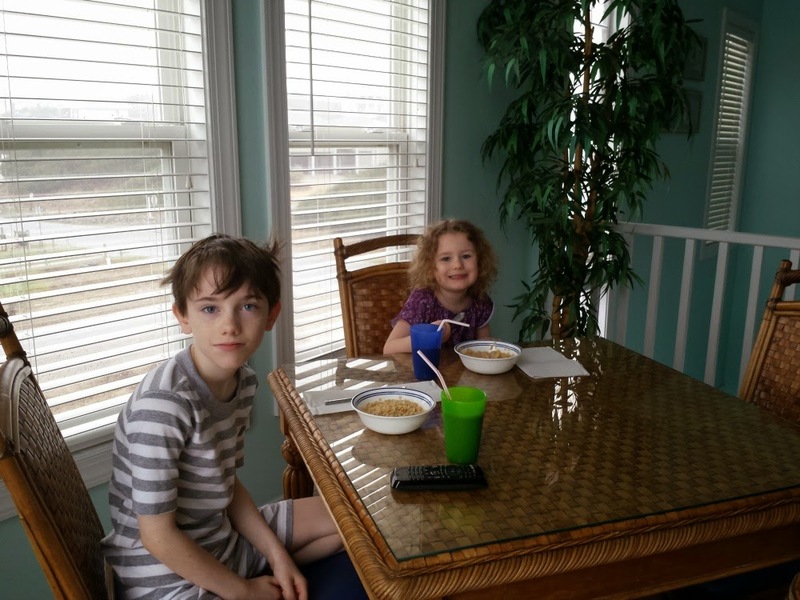 The great thing about a beach vacation rental is that you can make breakfast in your own kitchen, and have your coffee with an oceanfront view listening to the sound of the ocean. Go ahead, turn up the volume. Emerald Isle is not a bustling beach town. It's very residential which makes it a desirable vacation spot, in my opinion. There's a movie theatre, one grocery store on the island (another one over the bridge on the mainland), a waterslide park, miniature golf, retail shops, a great coffee shop, and some good restaurants. However, most of the historic attractions are located about 20 to 35 minutes away, which is fine when you're on a week-long beach vacation. You stay close to home most of the time, and then take a day or two to go sightseeing. However, for us, we hardly stayed in Emerald Isle at all due to the demands of our press schedule. 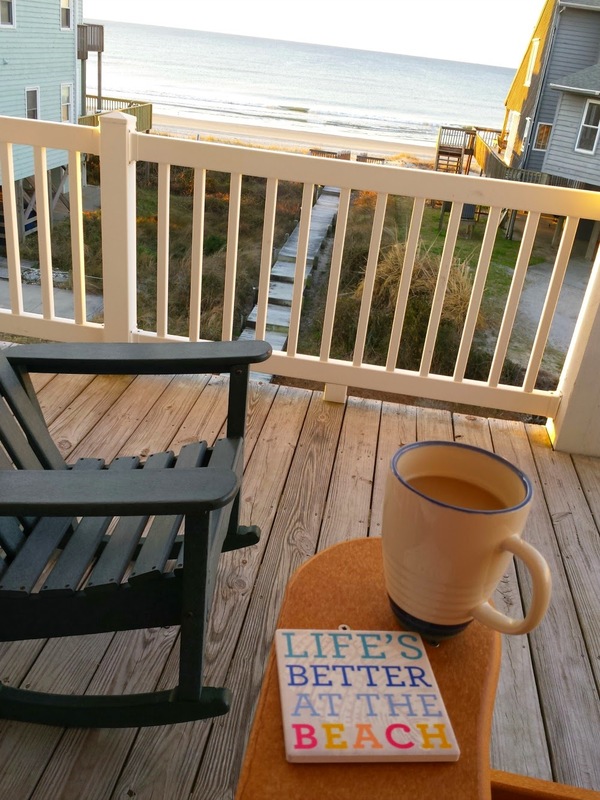 I switched an entire morning around just so we could lounge in the beach house and enjoy our beautiful surroundings. The kids loved it. We spent every day of our trip near Beaufort and Morehead City. If you want to be closer to the "action", you may want to consider Atlantic Beach (Home to Ft. Macon) and Pine Knoll Shores (Home to the North Carolina Aquarium-Pine Knoll Shores) as your base for beach rentals. 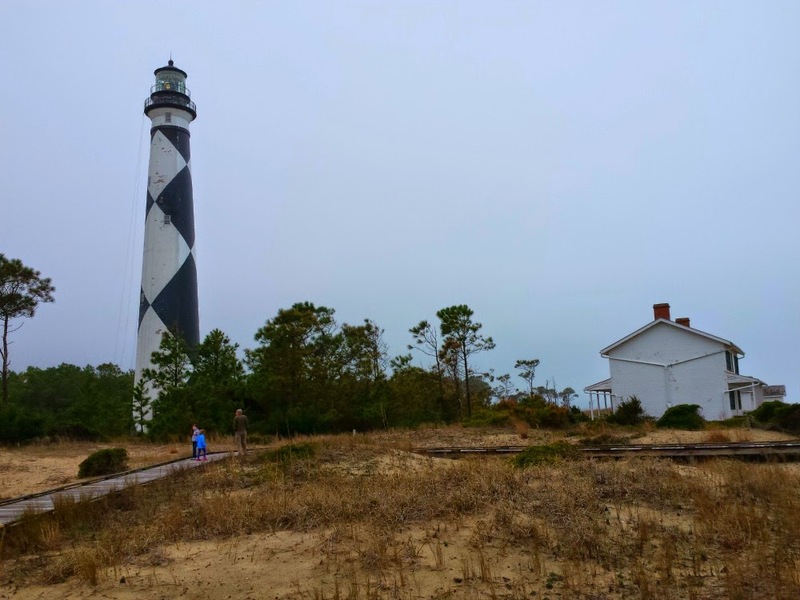 Despite my visiting the Crystal Coast often, I had never been to Harker's Island and Cape Lookout. On our first full-day in Carteret County, we drove to Harker's Island, which is about 50 minutes from Emerald Isle to catch a ferry to take us to Cape Lookout, which is one 14 U.S. National Parks in N.C. During the season, you can primitive camp on this island, enjoy its beach, visit the Cape Lookout lighthouse, and the Keeper's Quarters Museum. This area of the Atlantic is called the "Graveyard of the Atlantic" and keeping that light on in the lighthouse was one of the most important jobs or else lives would be lost. It was quite a lonely job. Typically, the shift was split between the keeper and his assistant. It was also a very isolated job, and the keeper's family would only come for certain periods of time. The Park service has done an outstanding job showcasing how important this role was during its time in history. From April 15-Oct. 1, you can also take a ferry to this area via Beaufort. 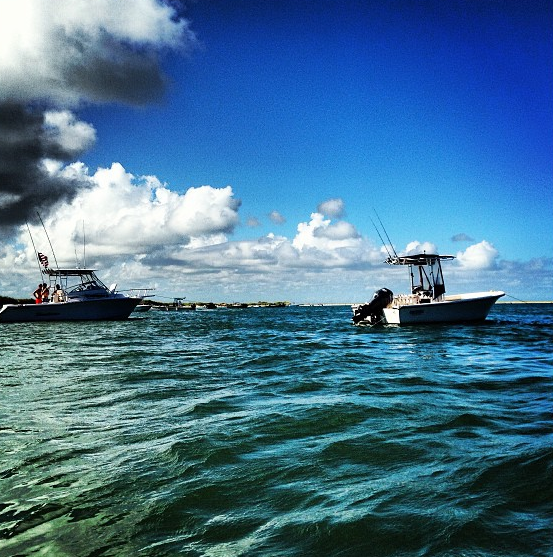 We were there right before the Cape Lookout opened for the season so we left from Harkers Island. Island Ferry Transportation provides transportation from both places. We took a small boat with our captain on what felt like the coldest day of the year. But, that small boat took us right to the edge of Shackleford Banks. A wild horse was there for us to see. More than 100 wild horses live on Shackleford Banks. The horses that are there now originated from Spanish Mustangs, who are believed to be the survivors of Spanish Galleon shipwrecks in this area. There also tours to Shackleford Banks where you can hike and learn more. 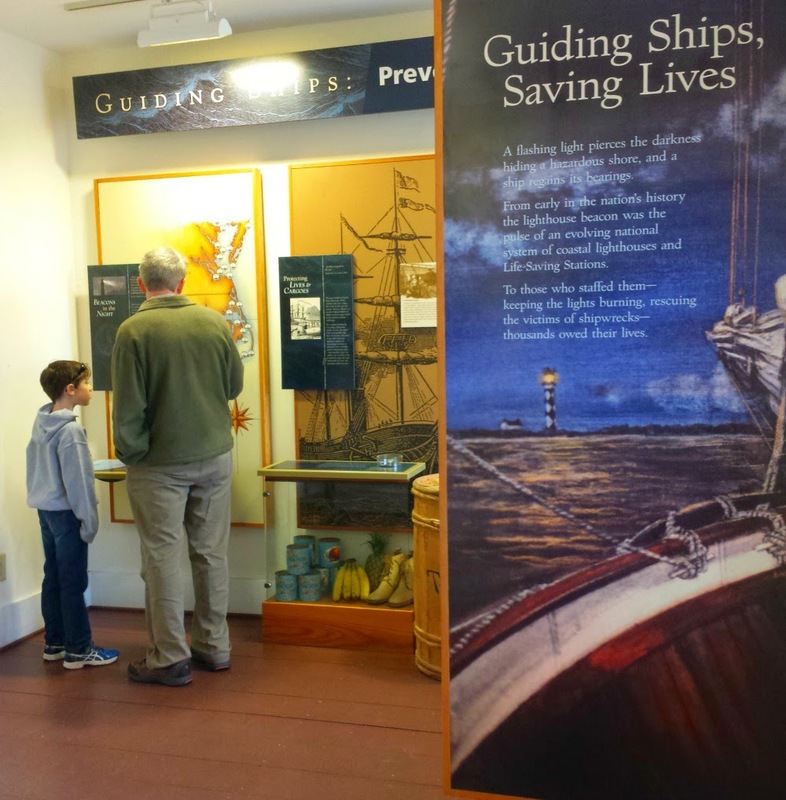 The NC Maritime Museum in Beaufort organizes those tours. There are three restaurants on Harker's Island and a small grocery store that also serves as a bait and tackle shop. 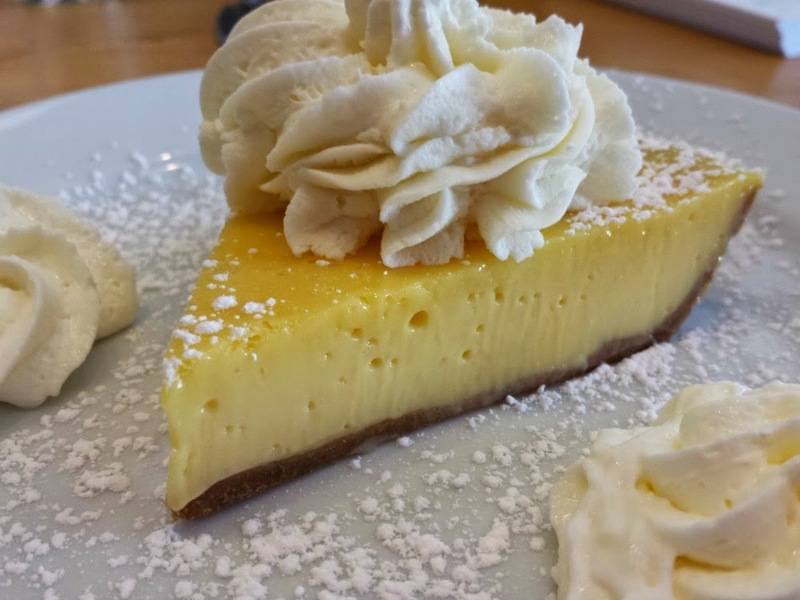 I ventured off the press agenda, and decided not to do lunch in Beaufort that day and instead, try my hand at one of the three restaurants. My original press agenda called for me to catch a ferry at 9 a.m. If you remember, Emerald Isle is 45 minutes away by car. We decided to catch the 12:15 p.m. ferry and returned back to Harker's Island shortly after 2 p.m. We were starving. Our boat captain said he really likes to dine at the Seaside Stop N' Shop Cafe, which is part of a gas station. Beaufort has a lot more dining options with waterfront atmosphere, but this little place was cute and good. It's also a lot cheaper than what you would find it Beaufort, too. 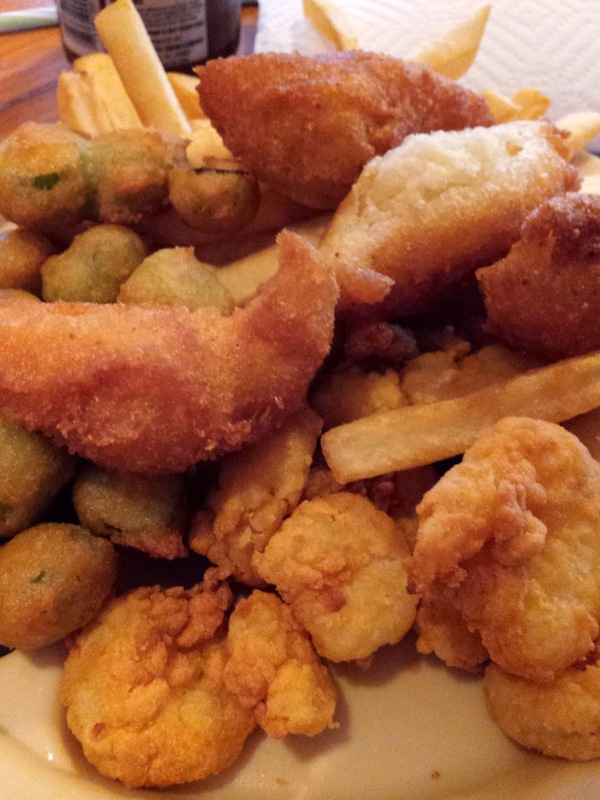 They have good fried okra, fried shrimp, and will prepare a burger anyway you like. A cheeseburger with mustard and pickles, please. We were too full for the homemade desserts, but something tells me that could have been the best thing about the place. 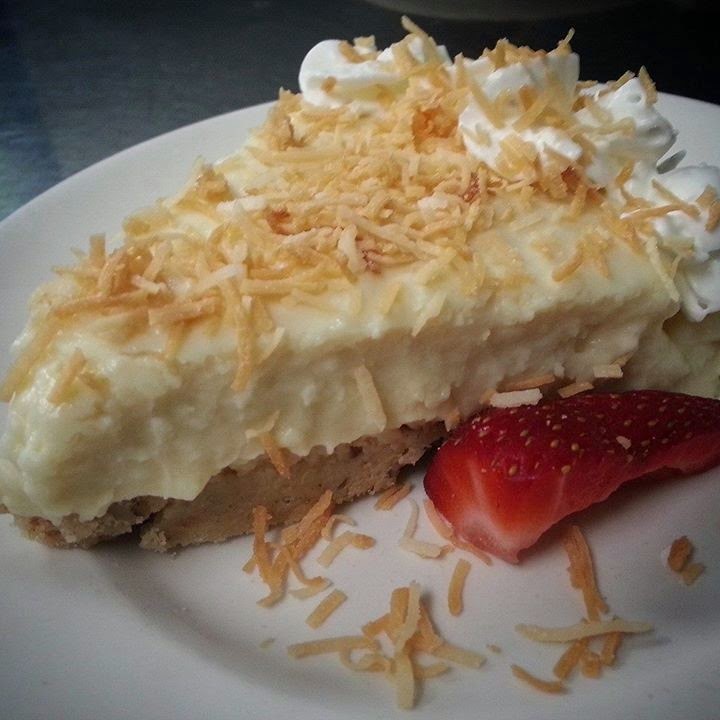 They had coconut pie. I'll have more on the Crystal Coast soon. I'll soon share some highlights of my favorite town, Beaufort, and share what we thought of some of the area restaurants. We certainly had a favorite. To plan your trip, visit Crystal Coast.com. Disclosure: My family was hosted by The Crystal Coast, and my opinions about the area are my own. I think if you vacation here, you'll enjoy it a lot. My thanks to our hosts who were always so gracious and eager to spread information about this North Carolina vacation destination. 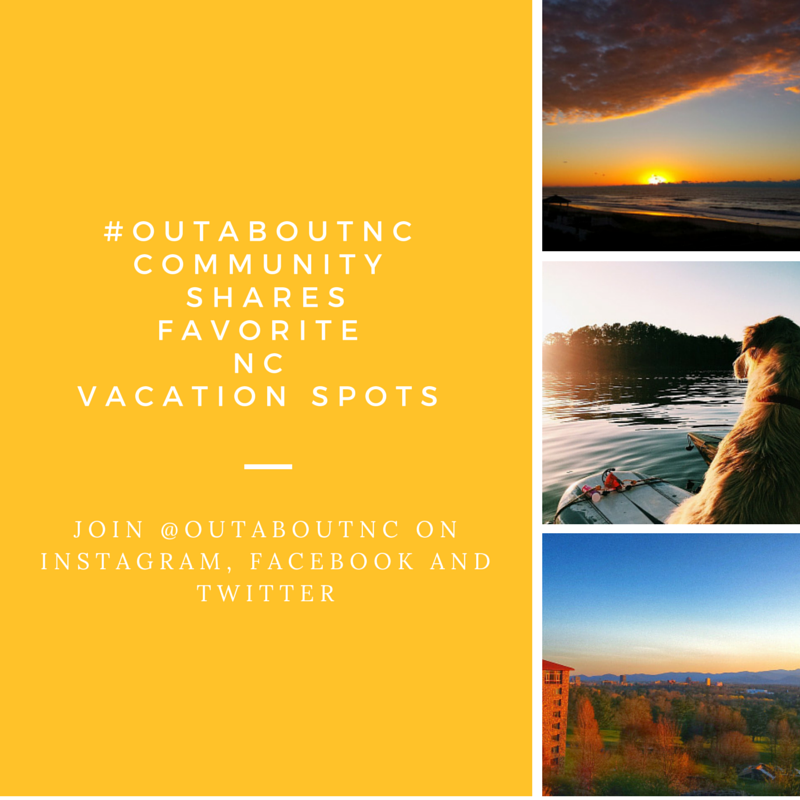 The goal of my new #outaboutnc travel guide community was for me to be able to offer vacation tips for people wanting to visit North Carolina. For this post, I partnered with the staff of Triangle Pest Control, a North Carolina based company, to sponsor our first travel tip series. The responses that staff are giving in this post are their own opinions, and are not sponsored by any travel or tourism agency. Let's see what Donnie, Jesse, Bernard, and Teryn have to say about traveling in North Carolina. We'll find out where they like to dine, stay, and play. Top and bottom photos are by Leigh Hines. Middle Photo is from #outaboutnc community instagrammer @WakeforArt. 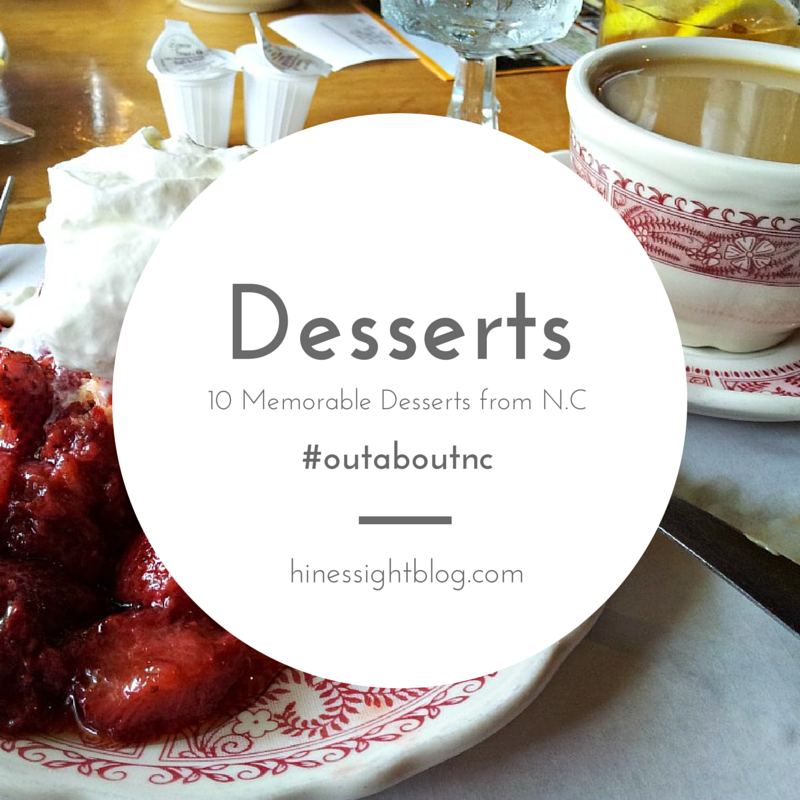 Q: Where’s your favorite place to vacation in NC? Q: Why do you like this place so much? Q: Where do you normally stay? Rent a house? Specific hotel? A: We normally rent a house on the beach. Q: What’s your favorite thing to do while on vacation? Boating? Surfing? Skiing? A: My favorite thing to do is to just play games with the kids on the beach and read. It is nice to unplug for a while and just have fun. When the weather does not quite cooperate we normally head into Wilmington to check out downtown (E.g. train museum, boat tour, etc…) or we go to the Aquarium at Kure Beach. Q: Where’s your favorite place to eat? 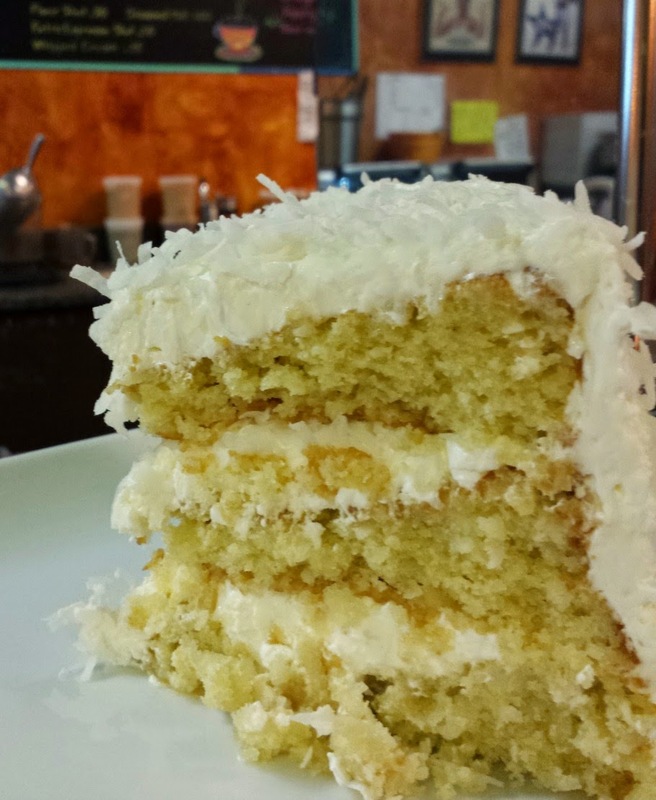 Are there a few restaurants you always look forward to going to, or is there a new place you want to try? A: Our default is The Oceanic at Wrightsville Beach. The food is hit or miss but I asked my wife to marry me next to the pier so there is somewhat of a sentimental tie there for our family. Q: Is there a hidden gem/business here? A specific beach access? Ski lift? Hole in the wall? 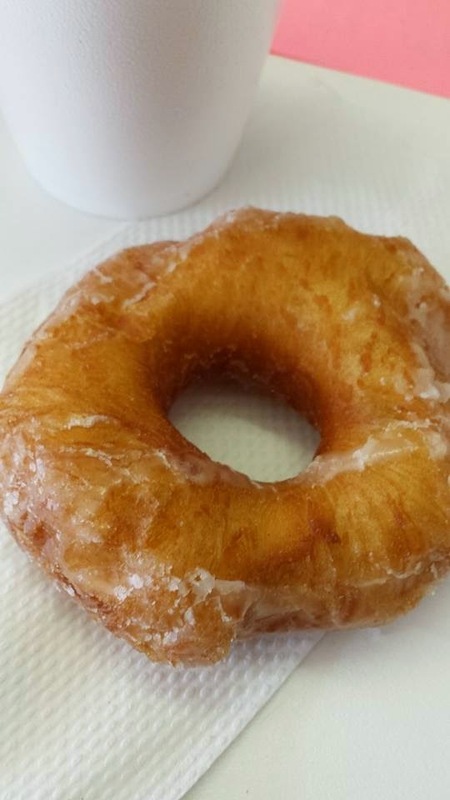 A: If you go to Carolina Beach there is a place called “Britt’s Donuts”. While I am not a donut person... these things are to die for. I think there’s even a fan club website devoted to these guys. There will always be a line and your kids will always thank you after a bag of Britts (after they are all sugared up of course). Q: What’s your favorite memory from this place? Have you brought back any souvenirs? 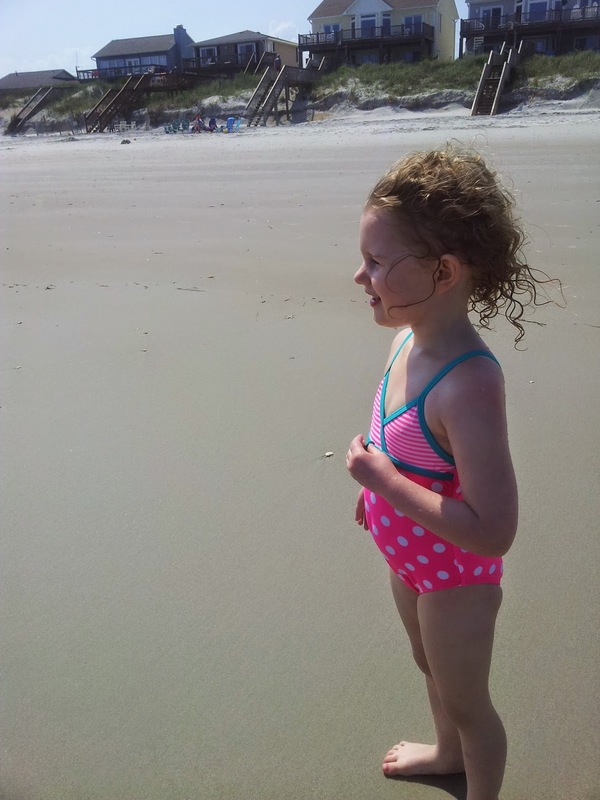 A: My family used to vacation at Topsail when I was a kid. Back then Topsail was a small town with only one store and a putt putt course. But as kids, we didn’t care. We would stay in this dive called the “Florida Apartments”. We played in the Ocean so much it was “difficult” to walk around if you know what I mean. I still remember those times when I drive through that area. Those are great memories with my family. Note to travelers: Donnie is talking about two different areas in this piece. 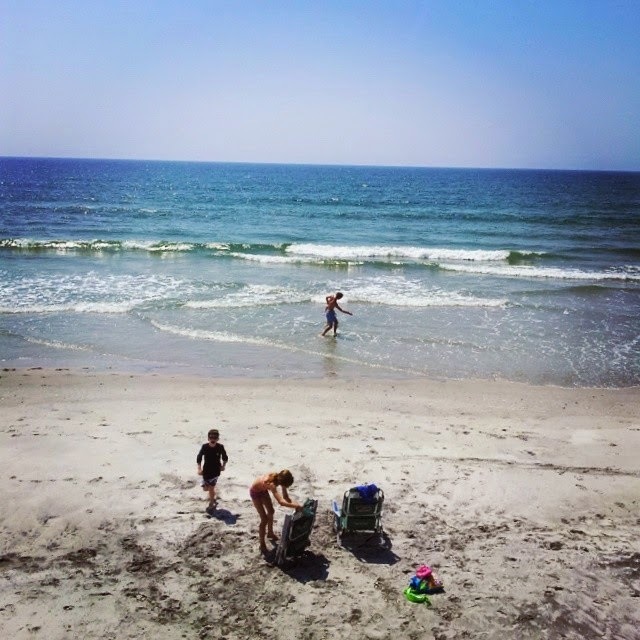 The Wilmington area beaches that include Wrightsville Beach and Carolina Beach are about a 35 to 45 minute drive from the Topsail area in Pender and Onslow Counties. Surf City and Topsail Island are located in Pender County. North Topsail where Donnie vacations includes Onslow County, too. A: It has all the outdoor activities you could ask for without giving up the amenities a city has to offer. There is just something about mountains that takes me to my happy place. A: Typically I’ll rent a cabin or a log home with a view. A: White water rafting and hiking. I think my next adventure will be testing out French Broad’s zipline. It’s in Marshall- which is just a half hour or so from Asheville. They have a mile worth of zipline and you have the option to zipline atnight. A: I typically will prepare food while I’m staying there and eat dinner on the deck while enjoying the view. If it’s the right season for it, I’ll swing by the Farmer’s Market to get a few fresh groceries. Next time, I would love to try the Omni Hotel’s Vue 1913 -- I hear the bison brisket is amazing. A: Quality time with family pretty much covers it. A: Oddly enough, my favorite place to vacation is more of a staycation. 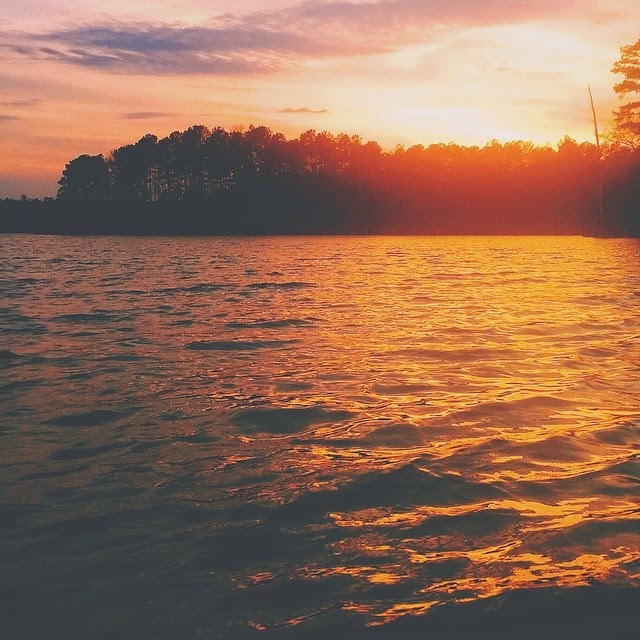 Falls Lake is a state park located just outside of Raleigh. Since I haven’t traveled much around North Carolina, I love just going to the lake. A: It feels like one of the most peaceful places on earth. I like the escape from the city, without having to pack up for the whole weekend. My family and I can pack a picnic of fresh foods from the State Farmer’s Market and The Butcher’s Market to grill out, then we take a walk on the trails or just watch the kids run free for a few hours. Q: What’s your favorite thing to do here? A: When I am on vacation my favorite thing to do is nothing. This is extremely difficult for both my wife and I! When we’re away for the day though, we really just want to give each other and our kids undivided attention. So whatever it is they want to do, we do -- with a few exceptions of course. Q: Is there a hidden gem here? A: There really is no hidden gem here. It is just about as straightforward as you can get. I think that is why I like it so much. When I am there I am just looking for serenity, and it never lets me down. Q: What’s your favorite memory from this place? My favorite memory was the first time that we went. My youngest son had yet to dig his toes into sand. He took 2 steps, turned around, and ran towards my wife. He hated it! He was high-stepping out of there like there were hot coals under him. Never before or never since have I seen a 9-month-old move like that! A: It’s where I grew up going. There’s something about this stretch of Carteret County that feels like home. Fishermen still occupy the beaches during the off-season and families make their way over the dunes during the summertime. Salter Path is the perfect getaway from Raleigh. A: We always rent a condo at Windward Dunes. If you have the fortune of booking a corner unit, the sunrises and sunsets are spectacular (depending on which side of the building you get). 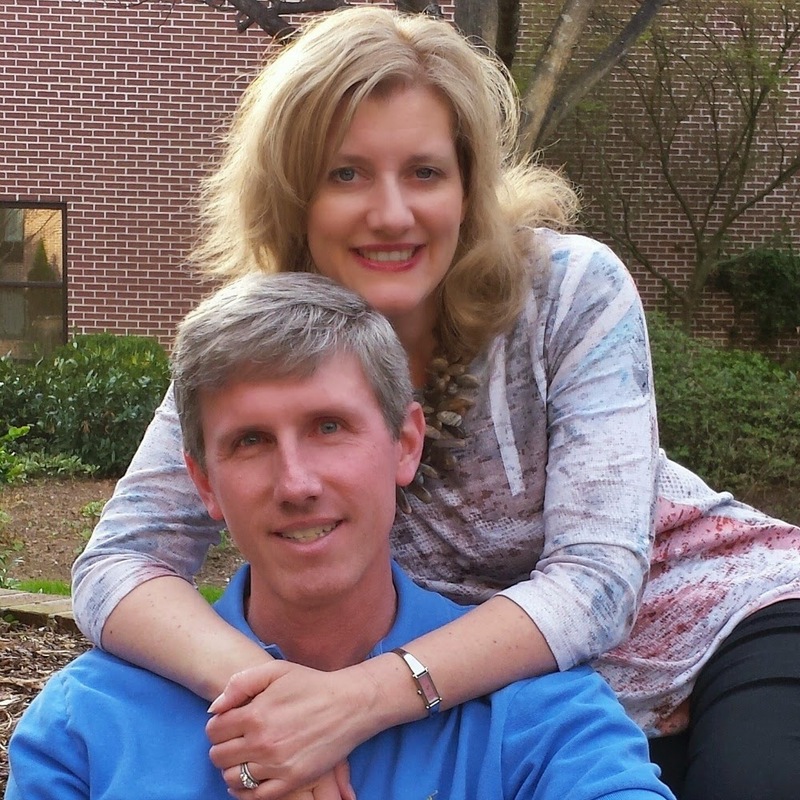 Kevin is the live-in property manager who is a die hard UNC fan and avid tennis player - if I’m ever bored, I’ll just pull up a rocking chair and listen to one of his stories. A: Several of my friends are from Morehead so I usually enjoy paddle boarding or boating with them. The Boathouse, where a lot of people dock, is a great place to grab a few snacks before heading out to Shackleford for the day. 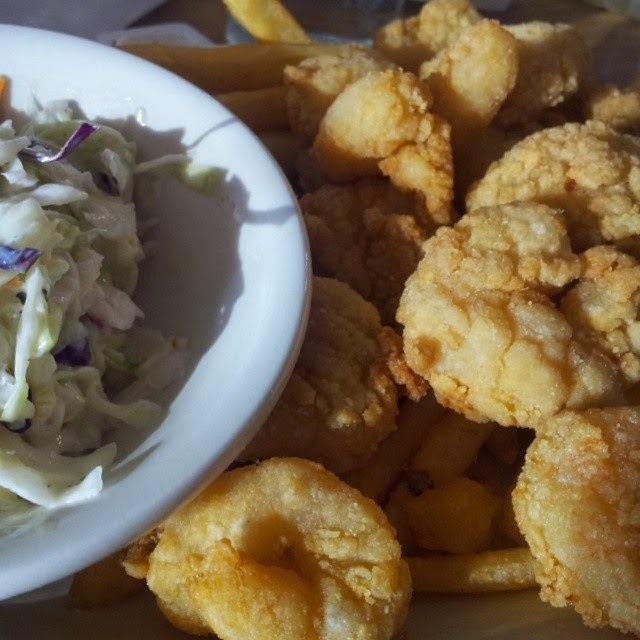 A: If I’m coming off the beach to grab lunch, The Big Oak is my go-to. The definition of a hole-in-the-wall, this place makes the best shrimp burger on the island. For a nice dinner with the family, we usually go to Front Street in Beaufort. Well worth the fifteen minute drive, the view is a toss up with the food; both are incredible. Parrott’s on11th is also a good one! A: I think the RooseveltPreserve is the gem. 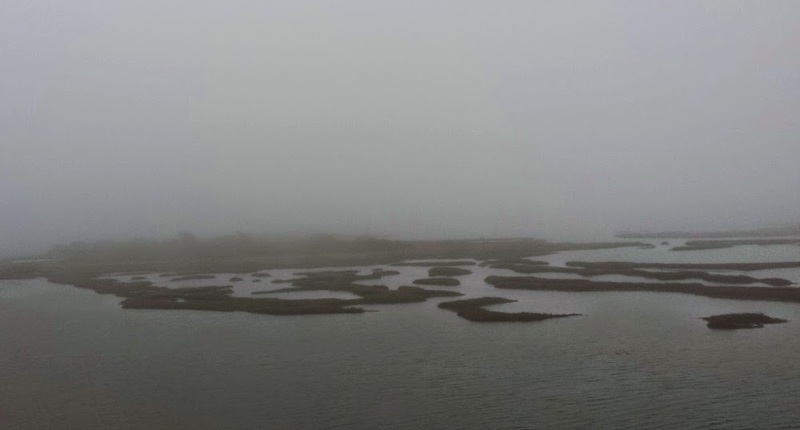 It’s a two-mile stretch of oceanfront land that can never be developed. It’s a wonderful contrast next to the often over-populated surrounding beaches. A: My grandmother is an early riser - she would always pack bagels and sea salt soaked apples for a 7 AM beach picnic. We did this for years; those memories are really special. Triangle Pest Control is a Green Pro Certified pest control company located in North Carolina. 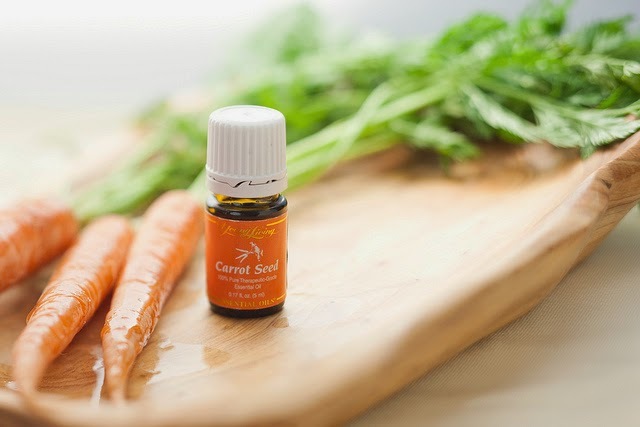 This locally owned and operated company is pleased to offer same-day, eco-friendly services to residents in Raleigh, Charlotte, and the surrounding cities. They are thankful for community support and look forward to continuing to provide dependable service to North Carolinians. 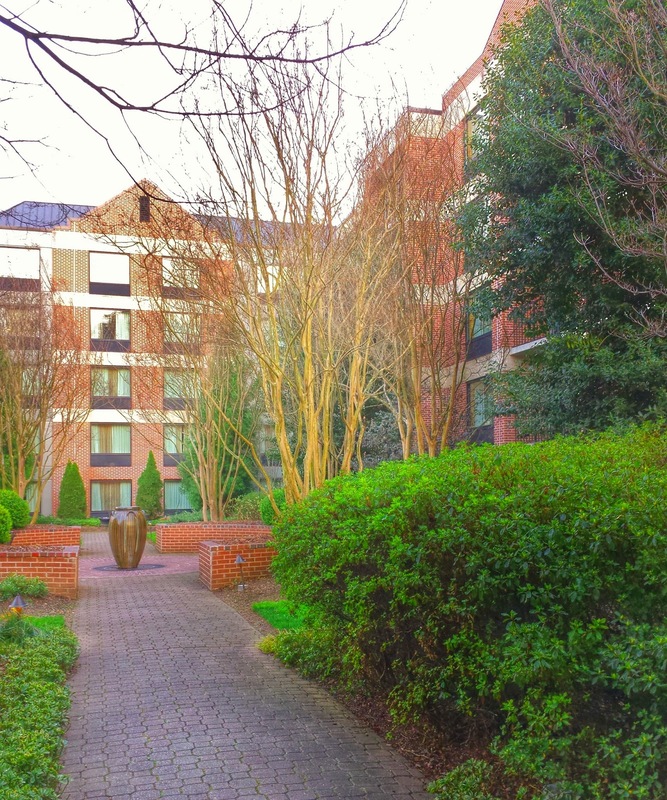 Tucked away next to the entrance of the Biltmore Estate in historic Biltmore Village is the DoubleTree Biltmore. 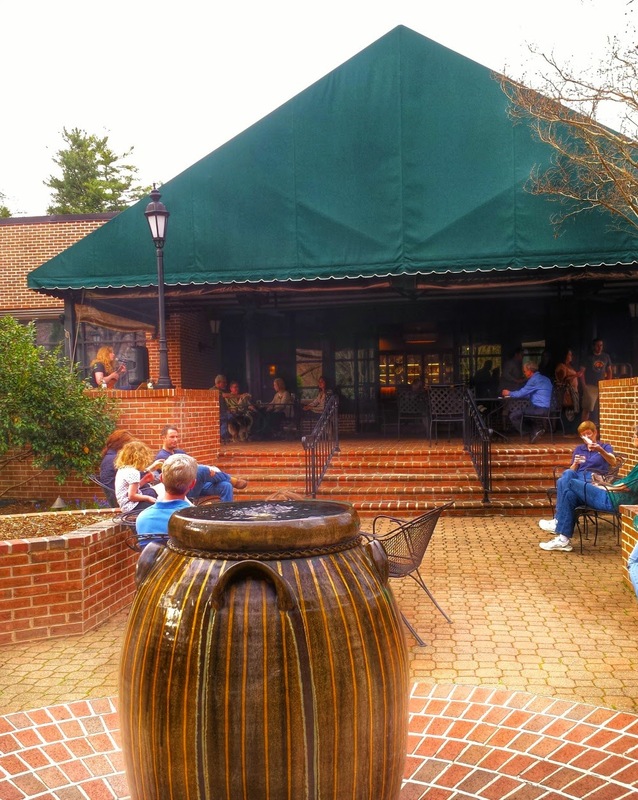 It is a full-service, upscale property that makes a great base for exploring Asheville, N.C. When I say full-service, it means the hotels offers the following: room service, a restaurant on site, and a person to assist you with your luggage. This is an upscale property, not a luxury property by definition. The hotel owners though have raised the bar on the Hilton brand to make this Doubletree doubly special, which is why I feel confident giving it a very good rating for my #outaboutnc travel community, which serves all travel budgets for N.C. I want to encourage you to browse hotel websites when you plan your vacation destinations because many times, they offer great packages that will save you money while exploring an area. Packages usually come with great perks. It's time for travelers to get beyond the "old phrase" that sounds like fingernails on a chalkboard to me, "It doesn't matter where I stay. A hotel is just a place to sleep." That saying may be true if you are going from Point A to Point B, and you need to stop to rest, but for vacations or weekend escapes, a hotel is NOT just a place to sleep. The right hotel can help enhance your travel experience. I found this to be true with the DoubleTree Biltmore on my trip to Asheville this month. 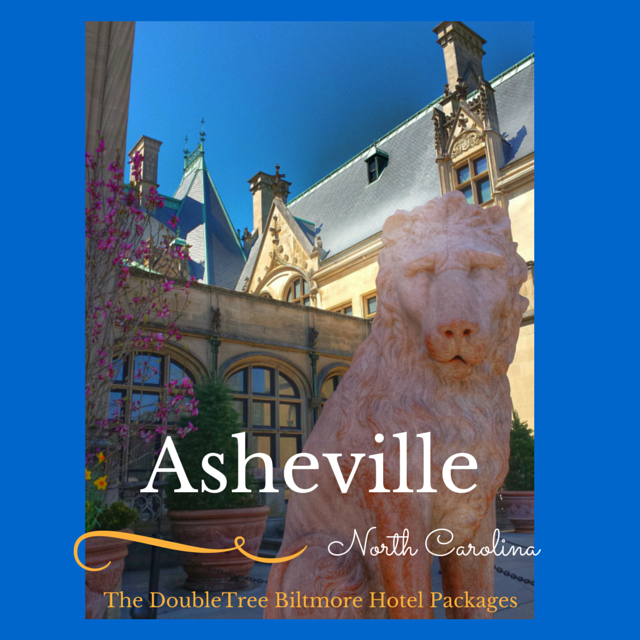 The Doubletree Biltmore, which is owned by Biltmore Farms, has a majestic jewel within a two-minute drive of the hotel. Asheville's Biltmore Estate is its' neighbor. 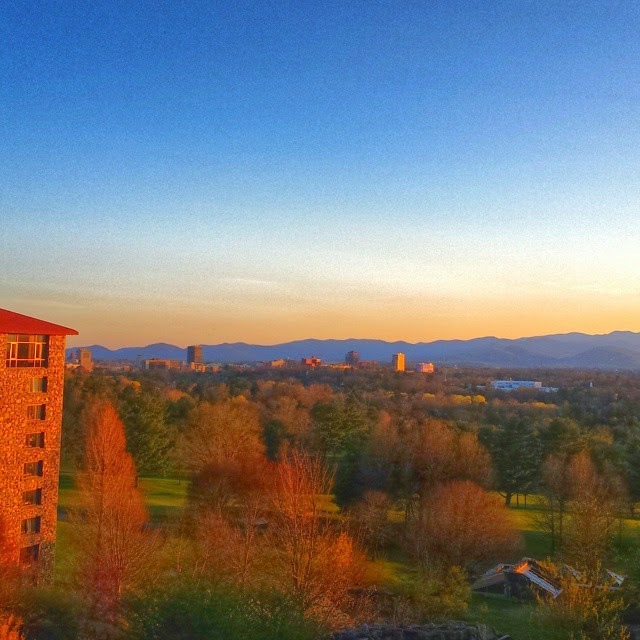 Location to the Biltmore Estate and easy access to good restaurants makes Doubletree Biltmore a good lodging choice for Asheville. I've stayed at the Inn at Biltmore on the estate, and it's beautiful. I recommend staying there, too which is evident from my "Pack Your Bags"
However, that Inn is perfect for couples and families who are willing to pay around $700 a night for a room and up. It's that simple. 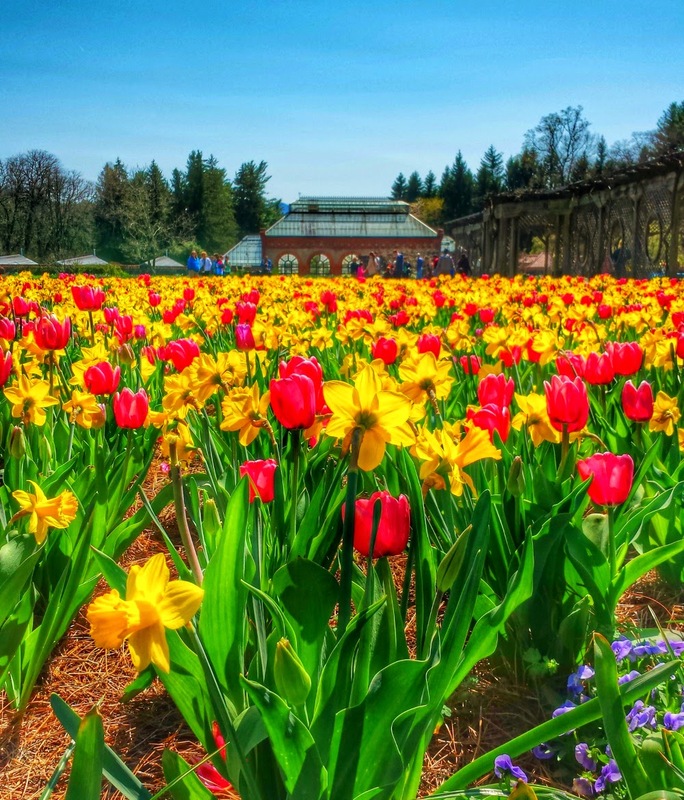 In peak season, such as this spring with Biltmore Blooms, a regular room at the Inn is priced at almost $750 per night and that does not include Biltmore House admittance or breakfast. Packages with house entry and breakfast start at over $1000 per night. 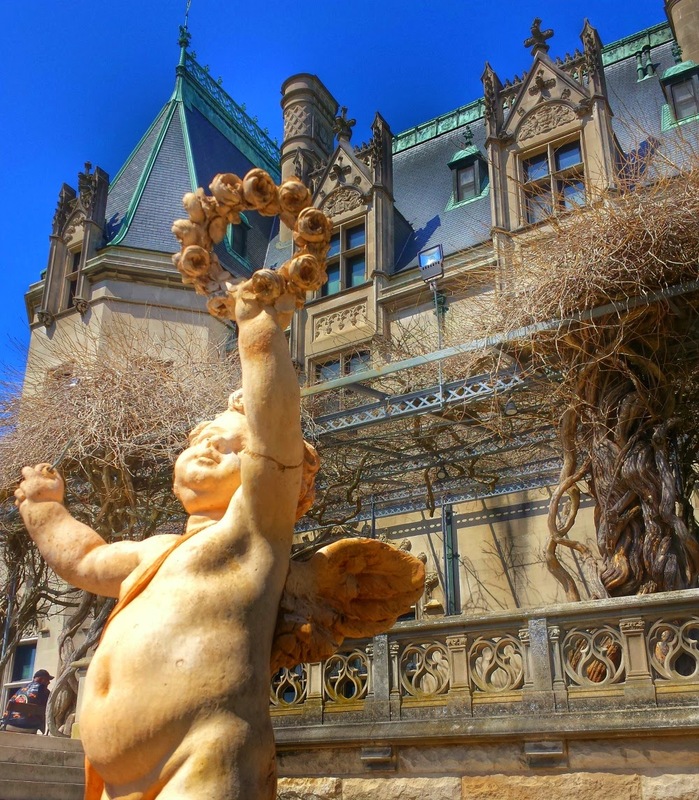 Day tickets purchased online to experience the Biltmore Estate begin at $47 for seven-day advance purchase tickets for adults, and $52 for tickets purchased with one to six days before a visit. The estate is building a new hotel for Antler Hill Village, but it will not be ready until December 2015. The price point will be lower than the original Inn, but packages will still hover around $500 in the winter and around $900 in spring. Room-only rates will be around $600 in the spring. If you can afford this, and are dying to stay on the estate, do it. You will love it. I personally think a few days of being on the estate, and treating it as a resort vacation is fabulous. 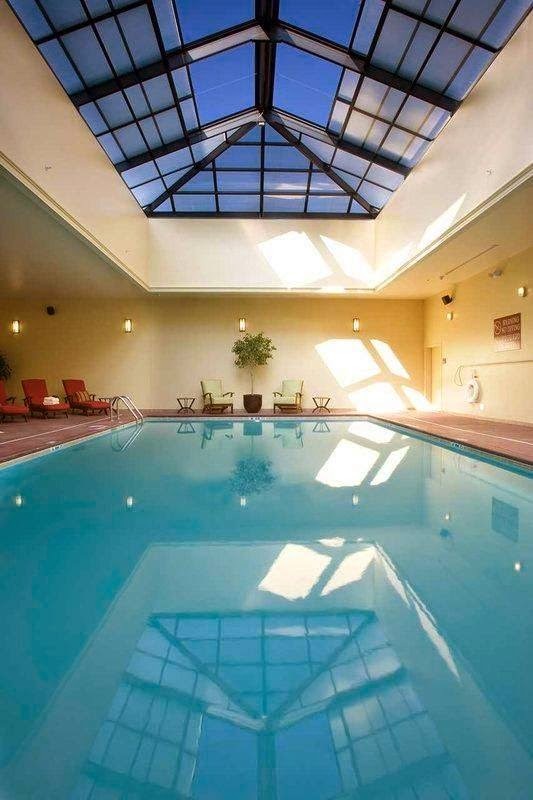 There is a spa, afternoon tea, and an outdoor pool. 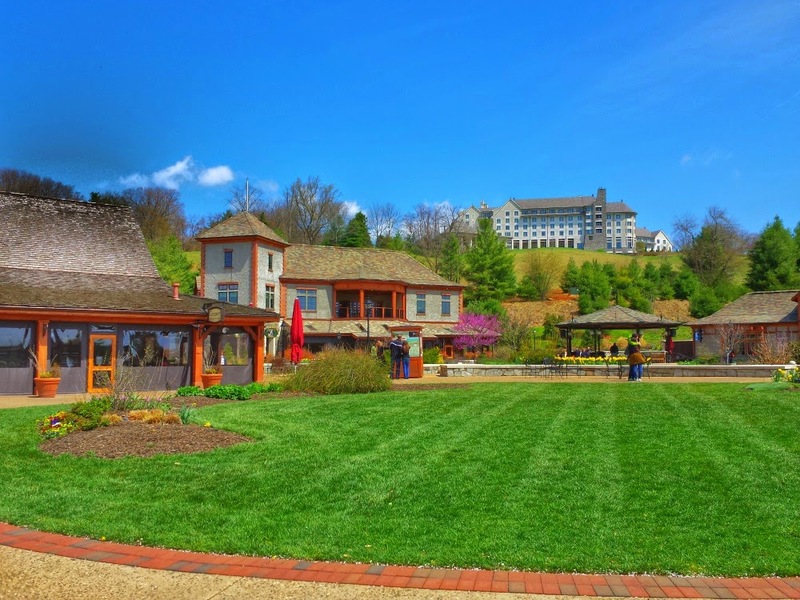 There are a lot of estate resort amenities that make you feel like you are living the life of a Vanderbilt.The new Antler Hill location will be even better than the Inn, in my opinion. But, not everyone can afford those rates, and those who may not want that type of expense for a weekend getaway in the mountains. The DoubleTree Biltmore lets guests have fun revealing what brought them to town. My daughter said, "Elsa and Anna", but that is all she knows how to spell really well besides her own name, and she added that, too. But, let's talk about a great alternative at a lower price point outside the gates of Biltmore. For couples and families wanting to spend less than $500, I have found a good alternative, and you can even get more savings through its hotel packages. First you must know, I'm not an advocate of hotel packages that offer just offer champagne or strawberries on arrival. To me, that just adds unnecessary expenses to your bill unless you are really wanting something special for an engagement or anniversary. I think these "romance" type of packages in the limited-service to upscale hotel market are what many travelers think of when they think of hotel packages and as a result, they never really check into them when seeking out a vacation destination. But you are making a mistake if you don't check the hotel site for packages to see what is offered. I'm a strong supporter of hotel packages that can help you save on excursions, give you a flavor of the area with dining, wine and beer experiences, breakfast offers, spa treatments, or extra family perks. This is what you need to look for when booking a hotel. You will save on your vacation and your travel experience will be greatly enhanced. 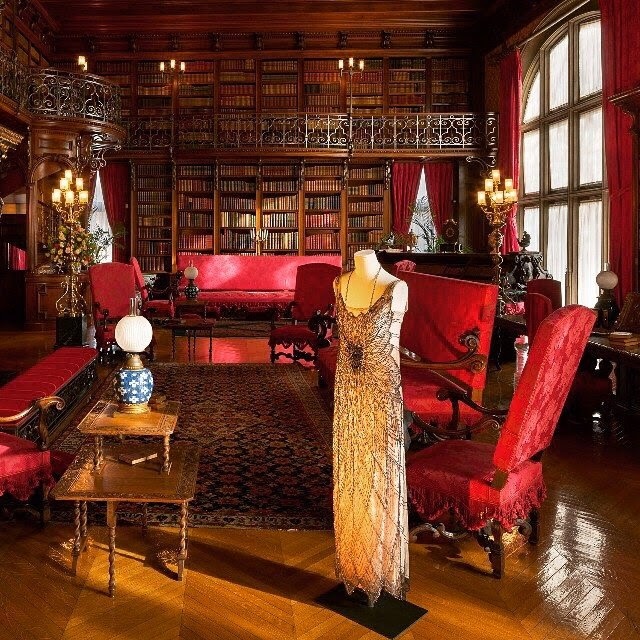 You can stay at the DoubleTree Biltmore, visit the Biltmore Estate, the Dressing Downton exhibit, and enjoy breakfast for rates starting as low as $280 for 2-double-bed room. And it can be as high as $416, depending on dates and demand. With your complimentary admission as part of your hotel package to Biltmore Estate, the estate is yours to explore at leisure The Spring gardens are magnificent right now. The food is always wonderful at Biltmore. 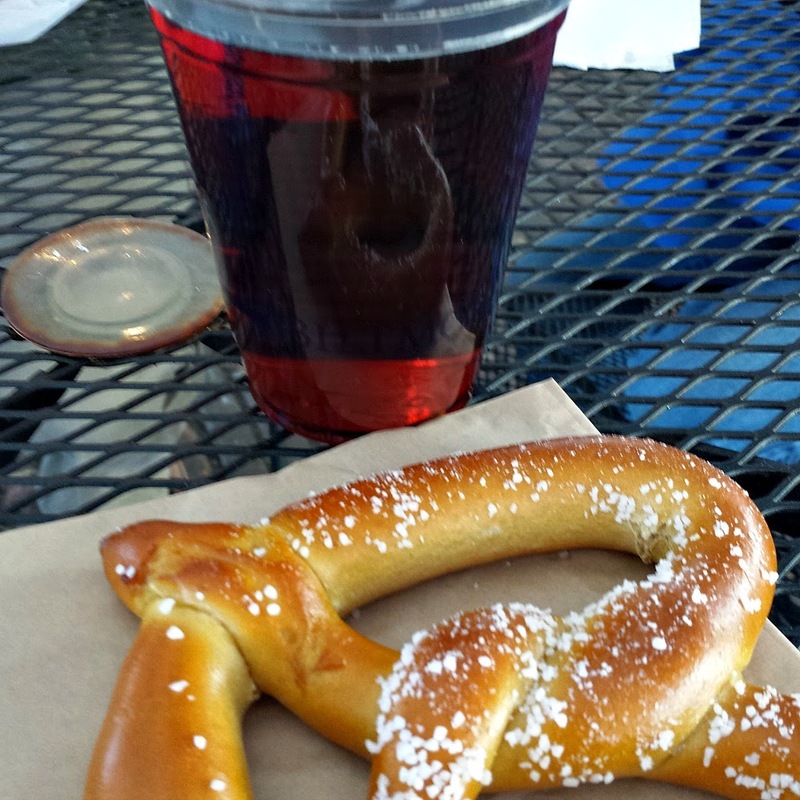 I enjoyed a break with Cedric's Beer and a pretzel. 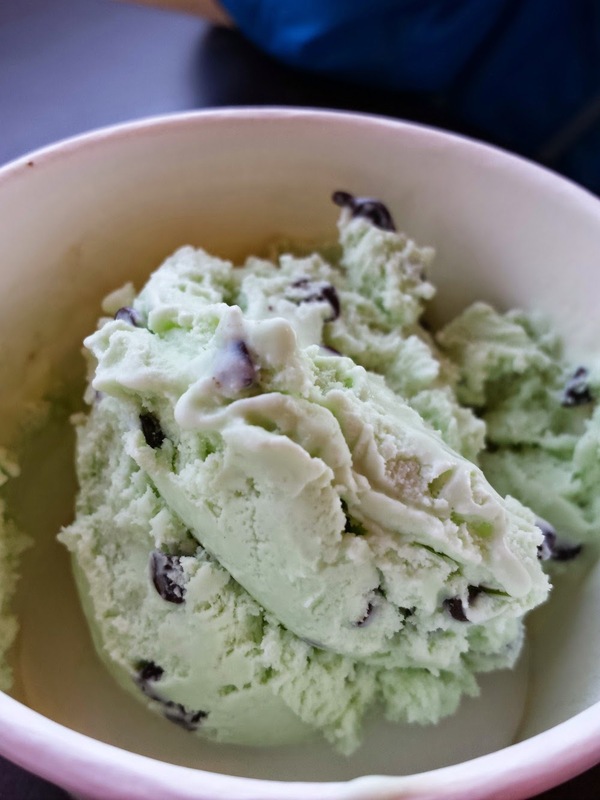 My kids will never leave the estate without visiting the creamery for ice cream. The Biltmore winery is also celebrating 30 years this year so a wine tasting there is always fun. Plus, they will have extra events going on to celebrate this milestone. On this trip, I purchased Biltmore Cardinal's Crest, the House Red, and of course, Cedric's Brown Ale. The Downton Abbey exhibit was outstanding. That exhibit ends on May 25, 2015. If you can, go see it. I really enjoyed seeing these clothes.The dresses are stunning in person, and Michelle Dockery, who plays Lady Mary, is so tiny. I bet she is a size zero. This was one of her dresses displayed in the library. Photo courtesy of Biltmore Press Office. Photography is not allowed inside the home by visitors. 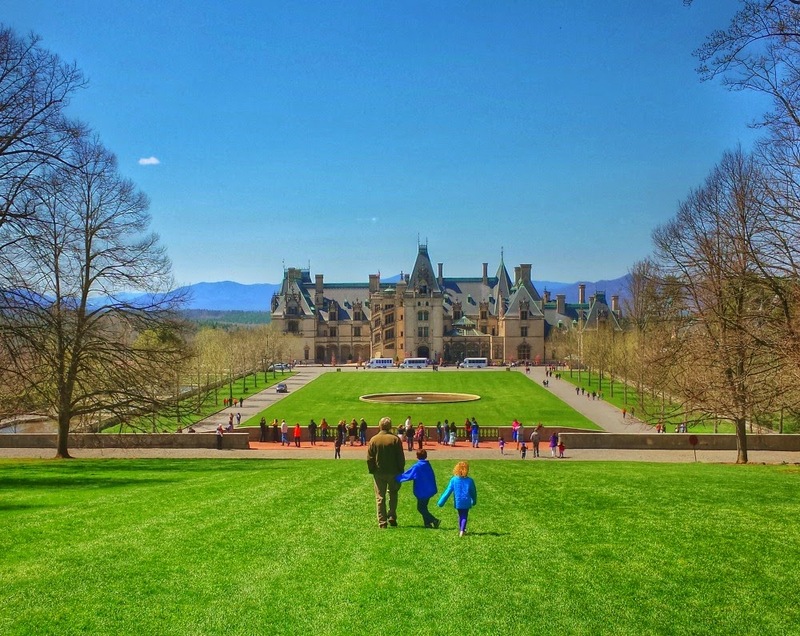 When visiting Biltmore, allow a full-day for sightseeing. The tickets the Doubletree give you are for two days so you have that wonderful feeling that you are able to go back the next day, if you didn't get everything done on your sightseeing list. You must check in at the visitor's center to get a time for admission into the house. We arrived at noon. You all know we're slow movers, and we could not get into the house until 4:45 pm (the last entry of the day). Peak times are busy. In reality, Biltmore has become such a popular tourist destination that every season is busy. The best lodging deals are in January, February, and early March for you future planners. After that, rates just soar and so do the crowds. The Doubletree Biltmore is a top-notch hotel with great management and you can tell that they want your stay to be the best. It was clean, staff members were friendly, and the hotel did little extras that made it special. We were there over the Easter holiday so they had crafts for kids and an egg hunt. 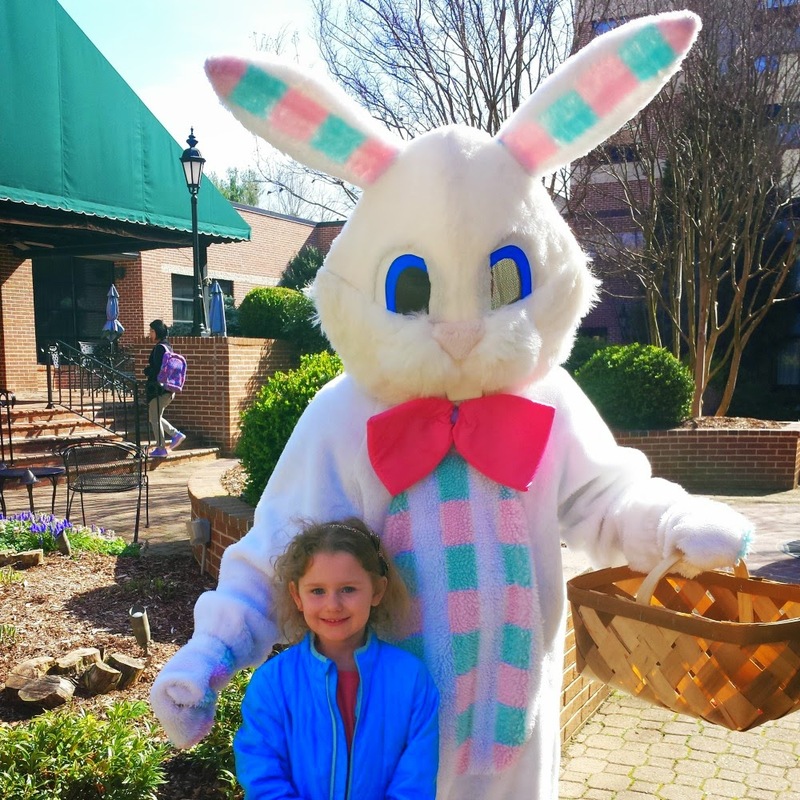 I asked Liza what she loved about our trip once we got before I starting writing this story, and she said, "Going to the indoor pool and hunting eggs with the bunny." So, it doesn't take much to make the kids happy when traveling, but its those extras that make things special and memorable. 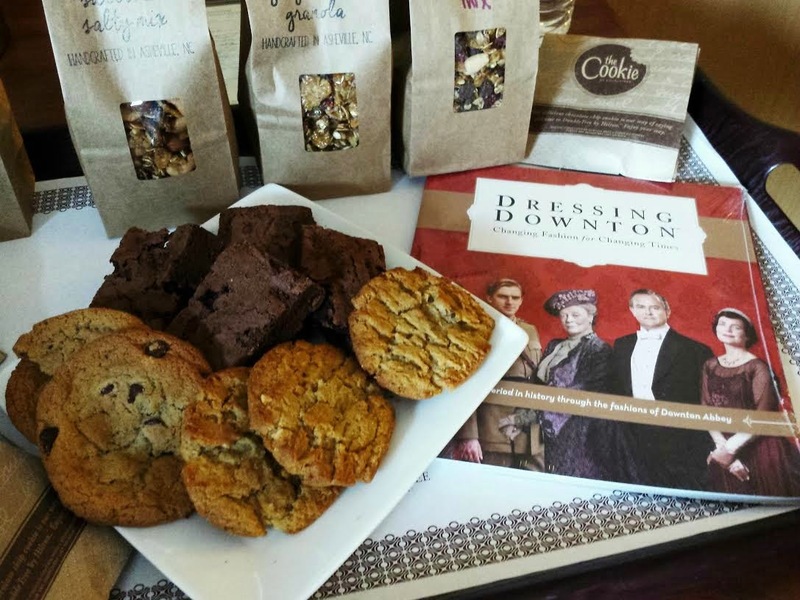 And of course, the DoubleTree chocolate cookies make everyone smile when checking-in. Any hotel that gives away cookies gets my kids' blessing. The Doubletree Biltmore underwent a renovation in 2013. 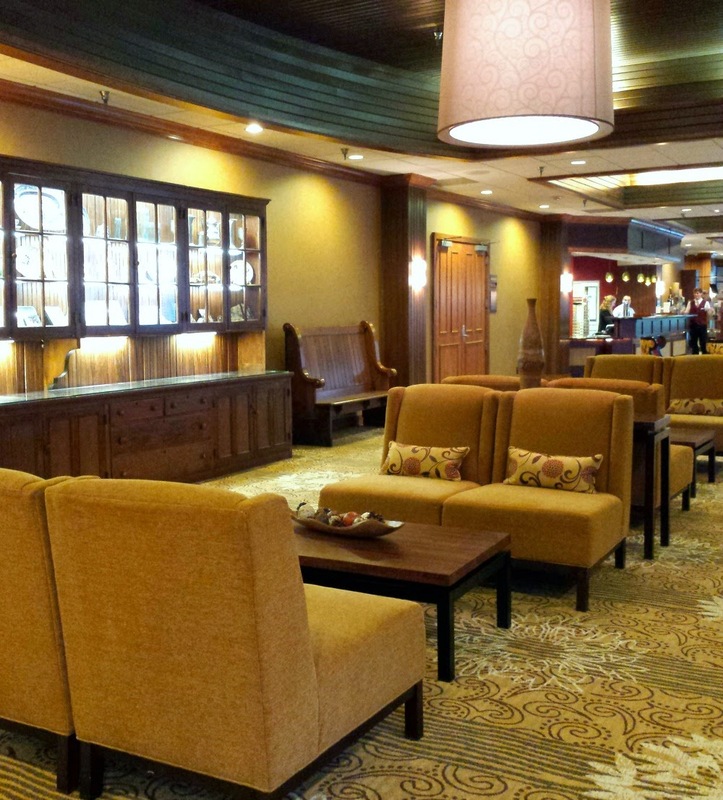 The lobby has an upscale feel with cranberry and tan tones. 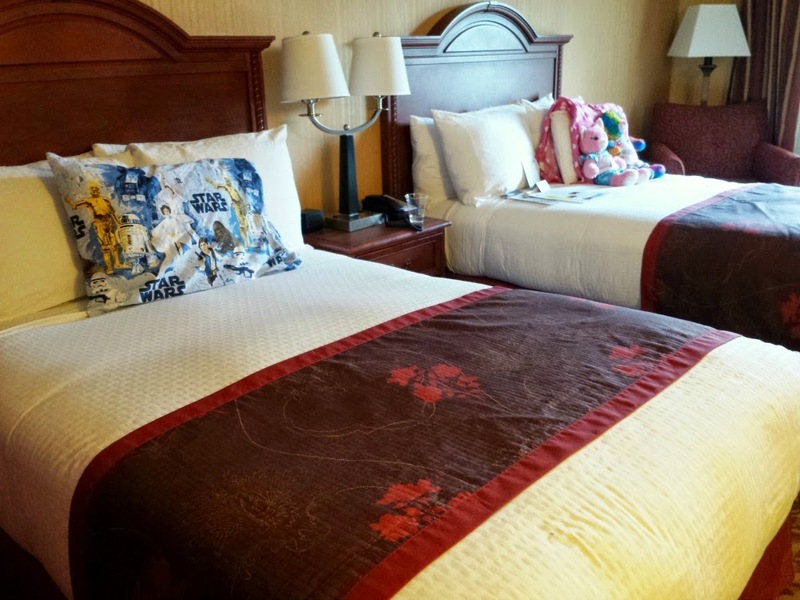 Regular double rooms are small for a family of four, but it's great for a weekend. The beds were cozy and upscale with good bedding. 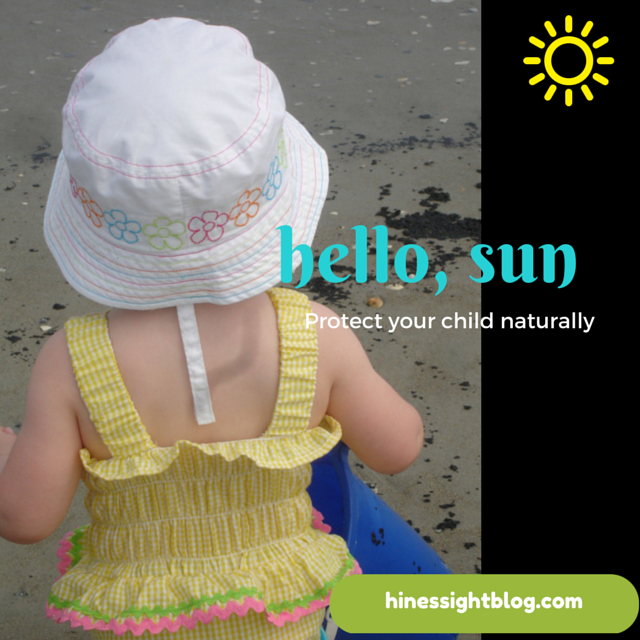 I had one child with me, and Will had one with him. Two adults in one double bed is harder to do, in my opinion, but it can be done. If you are staying longer, it would be my advice to invest in a suite or junior suite with a sleeper sofa, robes, microwave, and fridge. All bathrooms in the hotel are small, but they look nice. We were there on a holiday weekend with all rooms filled by guests so I experienced a room at the lowest price point for the package. 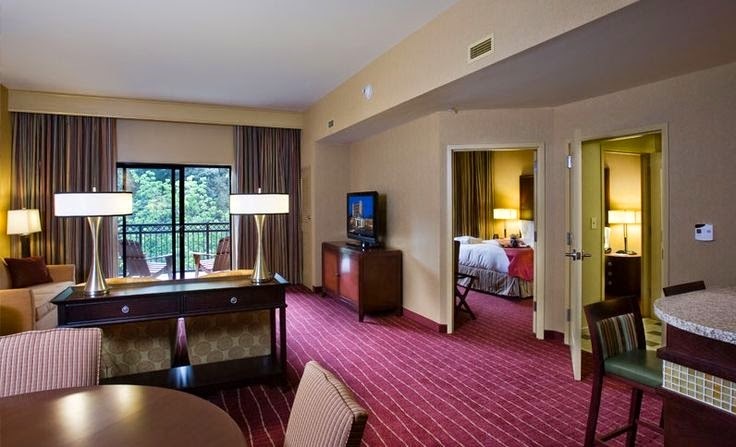 Ideally, the 2-queen premium room or a suite would be my recommendation if traveling with your family. It's not that much more in price, probably $20 to $75 tops for the Downton Abbey package, which is the hotel's most expensive package because of the official tour guide book. 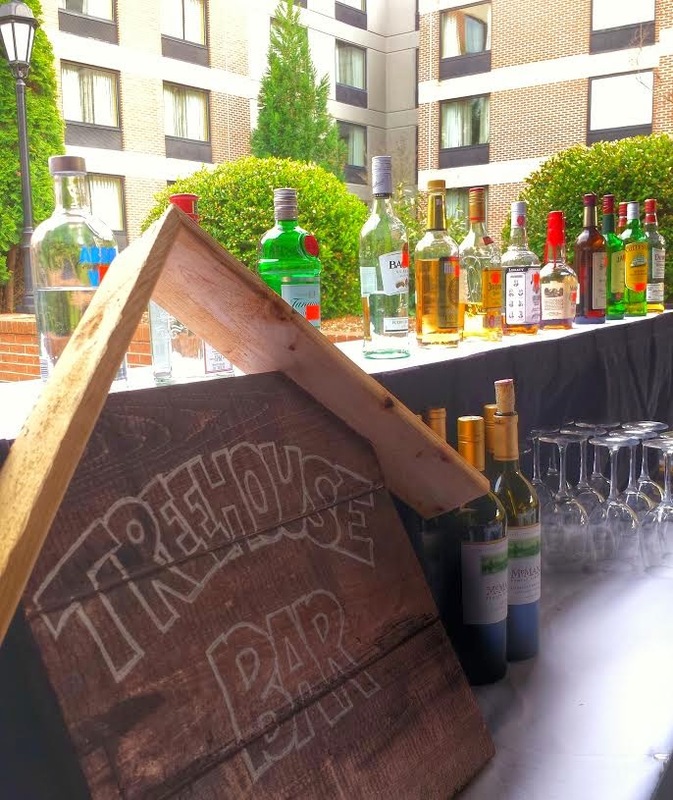 On Friday night, the hotel opens the Treehouse Bar in the courtyard. There is live music, and of course, beer and wine at an additional cost, but it's a great place to kick off the weekend. It's really fabulous when you check-in after you've been traveling all day. The Treehouse Bar usually runs from 4 pm to 7 pm on Friday only. 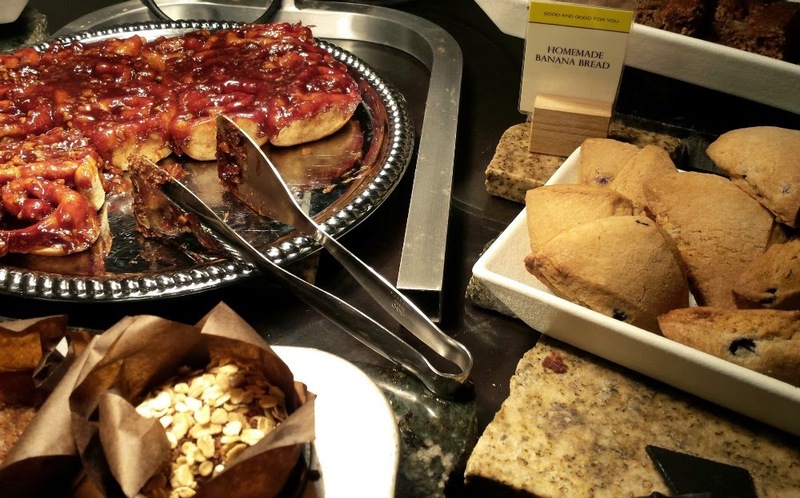 This hotel aims to impress with its breakfast buffet. 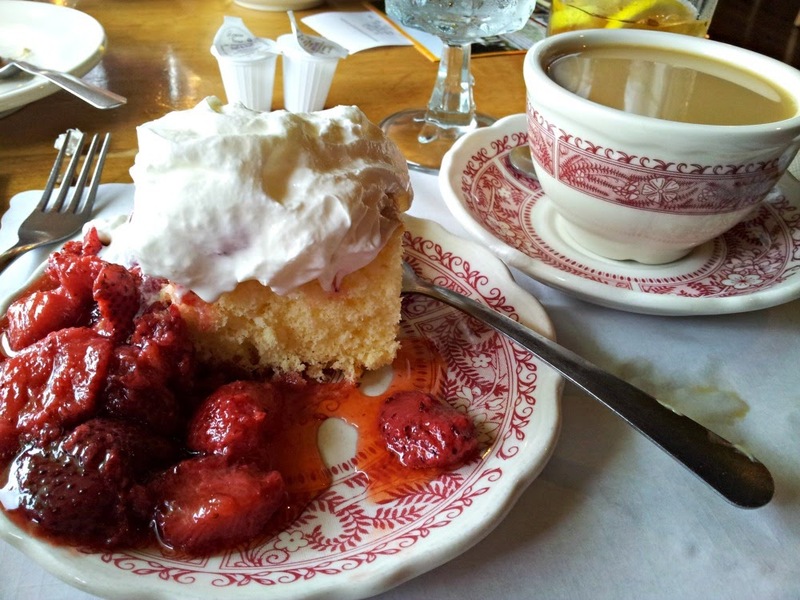 Breakfast is included in the Biltmore/Downton Abbey packages, and it is exceptional. The cost for adults is something like $11.95 and it is worth every penny. The public is welcome to dine there, too. 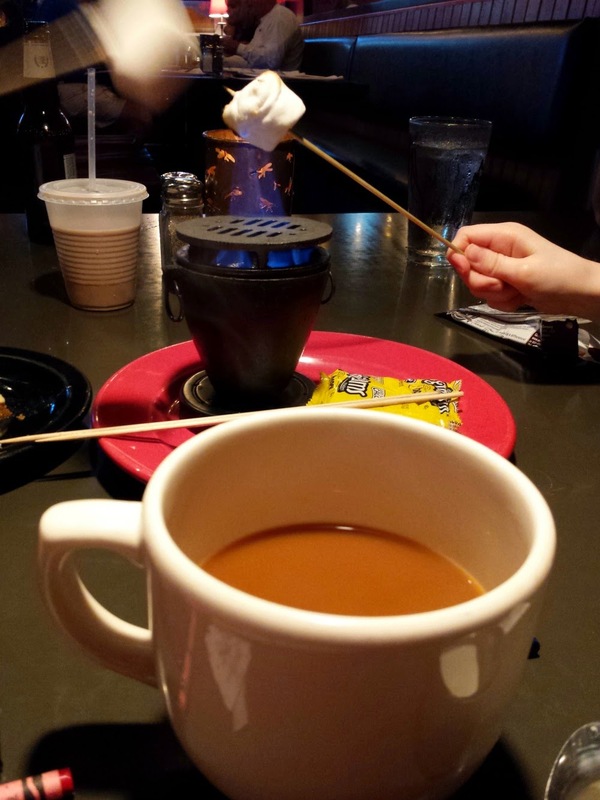 The Ducker Tea room is small, but I loved the intimate feel of it. While we were there, Chef Skip made omelets to order and I thought the "Blue Ridge", made with spinach, bacon, and feta cheese was delicious.Homemade sweets impressed and the blueberry scones got high marks from this scone lover. I could eat it without Devonshire cream. That says a lot. I give this breakfast a triple A plus. Is that even possible? Other guests agree with me. 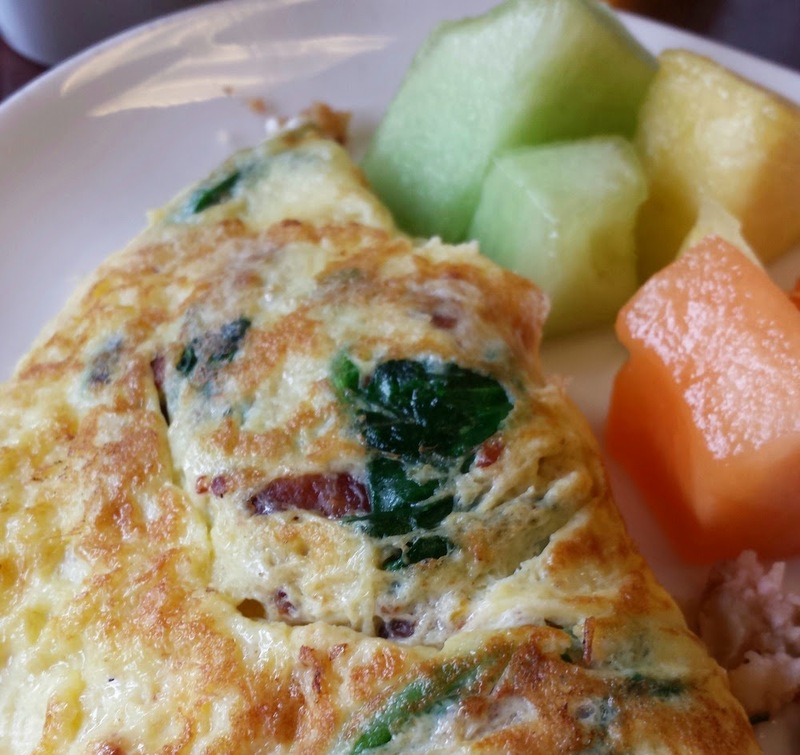 The Doubletree Asheville Biltmore consistently ranks as the number one DoubleTree brand within Hilton for the best breakfast in the U.S. My advice to you is not to skip breakfast here, and let Skip make you an omelet or any egg of your choosing. You will be so full that you will skip lunch, especially if you are late breakfast eaters like my family. There is a marketplace in the lobby that also sells a few items for you to have on the go. The marketplace also has local beer and wine in stock as well as much-needed items like band-aids and toothbrushes. I needed a band-aid for a boo-boo that really did not need a band-aid, but you pick your battles with children so I purchased a pack of travel band-aids for $1.50. I'm glad it was there for that reason. Two-nights in Asheville, N.C. is just not enough time. You definitely need more to explore the city. But, sometimes that is all you have available. 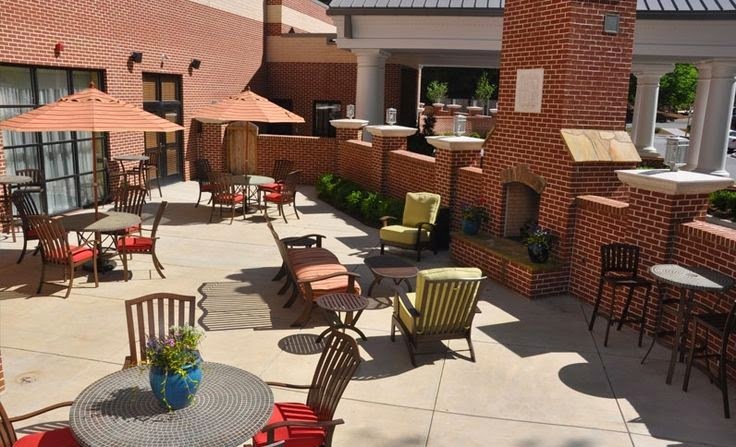 The Doubletree Biltmore makes a great base for exploring the Biltmore Estate, Biltmore Village, and downtown Asheville. It's a good fit for family travel. Kids can feel comfortable here. It is also pet-friendly. If I were staying longer than two nights, I would book a Queen Junior suite, which includes a sleeper sofa. You also have the option of getting a connecting double room. 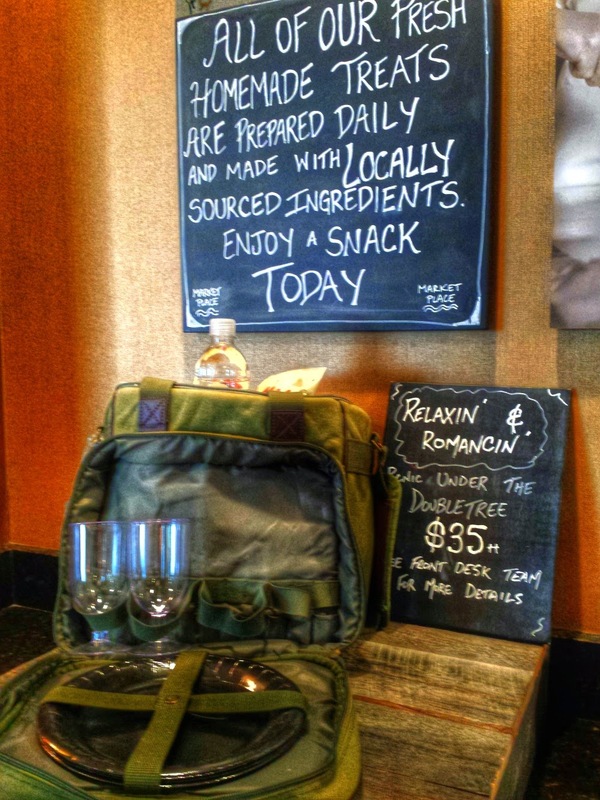 On your way out, be sure to buy some bags of Doubletree Trail Mix. It is delicious. I didn't eat any of it until I got home, and now we wish we had more. 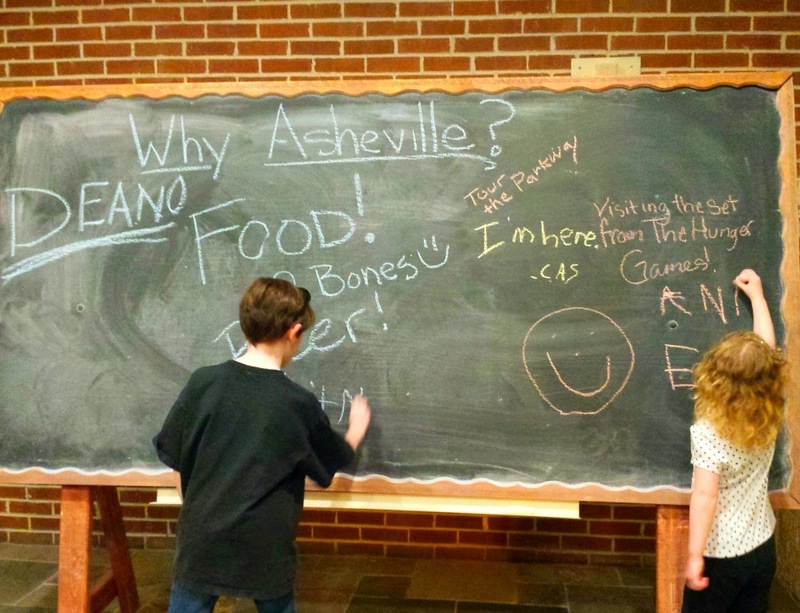 To plan your trip to Asheville, N.C. visit Explore Asheville. Disclosure: This was a hosted stay, and wrapped up a campaign where I gave one Downton Abbey experience to a reader. A winner was drawn on April 1 and she and her family will be experiencing this same package in May.